Working with customers is always something I enjoy very much as I get to hang out with people that are just as excited about a build as I am. My customer Chris is no exception in this case. Overwhelmed with the amount of knowledge from StarWars universe he brings to the table we embarked on a journey to design his dream Scalemodel Gaming Computer. Here are some of the challenges we imposed ourselves and some of the design decisions we made. Thats the phrase that came to mind when we started with our first skype design session. Chris had the preference for the Tector class ship as he believes its the definition of a warship. Most other classes were more geared towards either troop movement, transport or tie-fighter deployment. The Tector is deployed when you want to come in heavy, make a lasting impression and crush any resistance you might find .. BUT .. the Tector ship and its data was nowehere to be found. It looked like the Tector was scraped for the archives. So we went for the Allegiance class. Which is almost the same as the Tector and with the modifications Chris wanted its going to be a little bit different anyway. After our initial “Scrape the Web” session for anything usefull we came across the impressive designs by fractalsponge. His work is off the scale in terms of detail and structure. But I am not one for just plain copy and paste work and Chris had some specific elements he wants to build into it. So the Kraken will be based on the magnificent work by Fractalsponge but the greebling and some hull design and mainly the armament will be changed. We agreed upon a scale of 1:1000 which means that this build is 2.2 meters or 86inch long! I started out with putting the basic shape in the dimensions I needed. 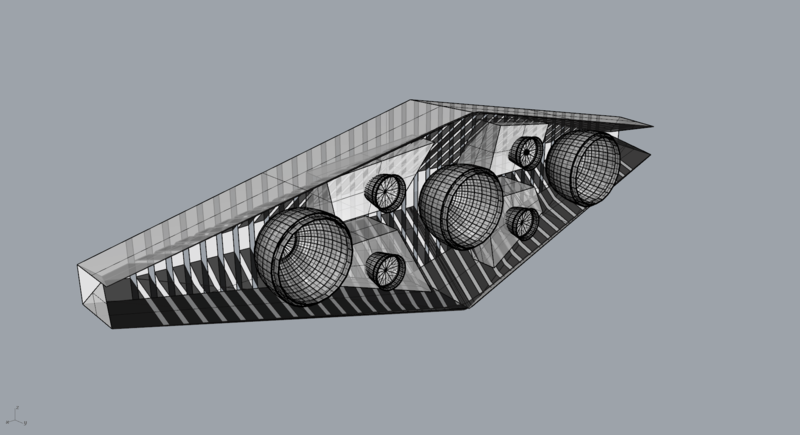 Basix box modelling to get a first idea of scale and dimensions. 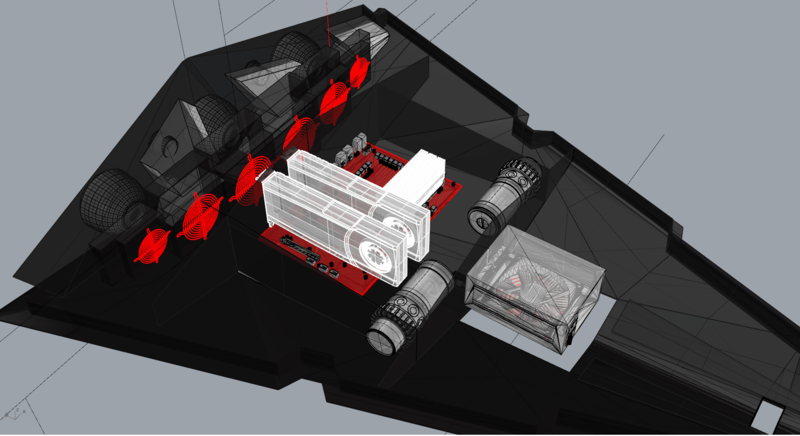 Added some boxes representing the different computer parts that needed to go in the body and superstructure and mapped out the realestate. Chris wanted a very good machine but not so much over the top with 4 GPU fully liquidcooled and such but he wanted to leave the option to possibly add a third high powered GPU later. So we were looking at a top of the line board with good specs and superb looks. 2 x big SSD, 3 GPU, 2 reservoirs in case we want to tilt the vessel from the stand we are designing and one reservoir could potentially run dry, big PSU for the overclocked cards and so on. 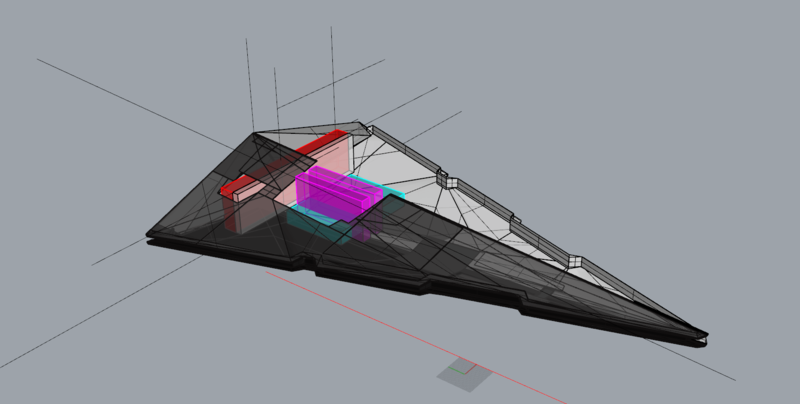 The primary idea I had was to use a 540mm radiator venting the warm air from the computer at the enbgine side of the ship. 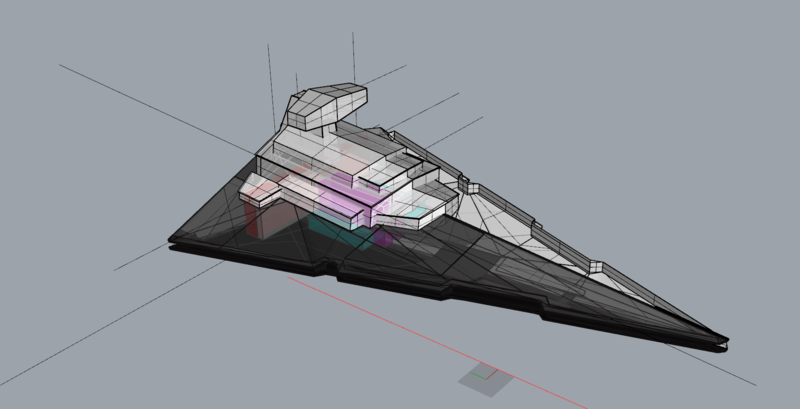 But the massive radaitor didnt match up with the ships hull and forced me to do some cutting and extend the superstructure to accomodate the design. That dont sit well with me. So I had to figure my way out of that as the system does need the cooling capacity or more even. So I had to scrap that idea. Then I thought of dividing the heat into sections of the rest of the hull but that would mean big radiators along the bottom and there was no way to integrate the surface area needed for the grill through which the warm air would vent. And it would heat up the body as the warm air rises. So I looked at what I had laying around and found a couple of old radiators from 2012. Some 140 some 120 some 90 and a new idea was born. I think this is the best way how to cool this puppy. Single fan radiators in 90 – 120 – 140 – 140 – 120 – 90 configuration. So the size of the radiator increases towards the middle of the ship. This way it uses the full shape of the hull and provide an aditional percentage of cooling cap. Seeing the pipe work in my mind I think it would look great too. Check for now but I will come back to this topic in the 0.1mm design. For the other side of the radiator I needed a grill, a visually good method of creating space to vent the warm air. After a few doodling session that didnt lead to anything I came up with this design. Here is a dirty render to get a better feel of the fangrill. 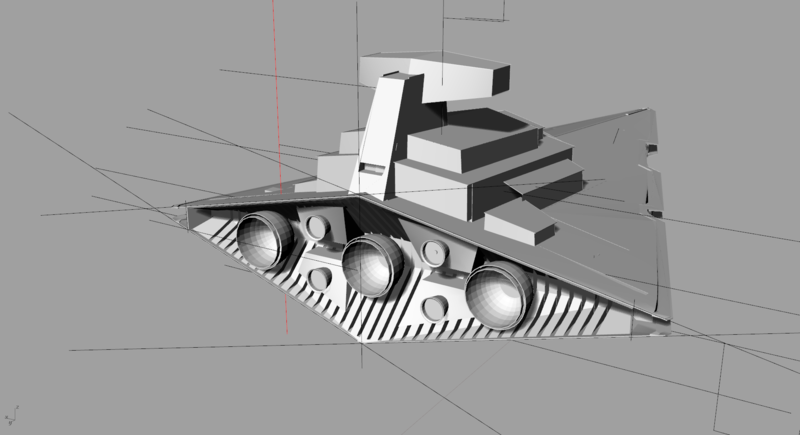 It must be strong enough to withstand quite some heat coming from the radiator as it needs to be integrated with the engines and support greeble structures. I am thinking a 3dprint material with a very high HDT (heat deflection temperature), high dimensional accuracy and quite strong. I will come back to this topic and select the material later.